Quality - Ferrolux Metal Co.
Day After Day, Our Goal Is The Same: Deliver Superior Exposed Cold Rolled Processing On Every Inch Of Every Order. Ferrolux is committed to delivering flawless, slit material. Ongoing quality assurance investments allow us to provide cold rolled processing with unmatched uniformity and superior consistency. Our two Stamco lines features x-ray gauging and coil defect mapping systems, DC controlled tension and simultaneous top and bottom inspection with Unilux strobe-lights. Sophisticated equipment and proven processes result in outstanding inspection and slitting services. IATF 16949:2016 CERTIFICATION PROVES FERROLUX PROVIDES CONSISTENTLY SUPERIOR QUALITY. In the automotive business, where the standards are high, there are some suppliers that still stand out above the crowd. 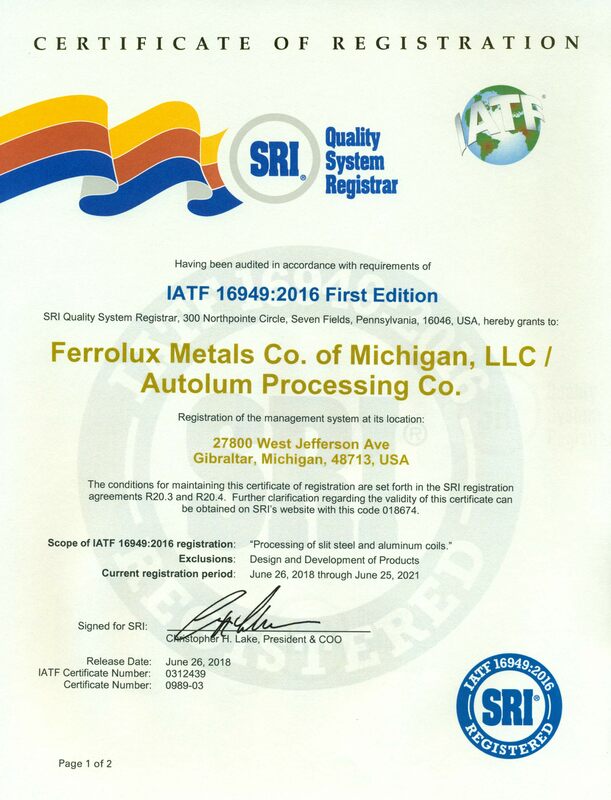 IATF 16949:2016 certification, combined with our commitment to zero defects and 100% on-time delivery will put Ferrolux among your elite group of preferred suppliers for cold rolled processing, slitting and inspection.